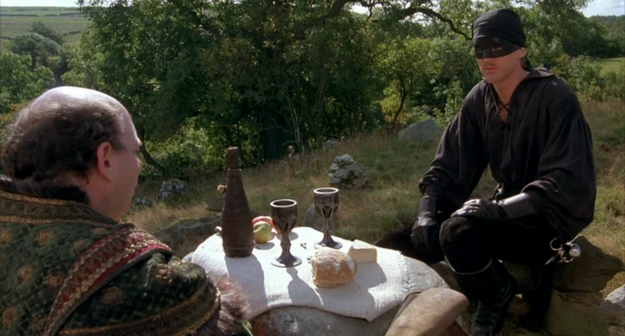 If you haven’t seen The Princess Bride, then you must immediately, not least for the classic Battle of Wits scene between Vizzini and the Man in Black. It’s a challenge: To the death! For the princess! Which of the two goblets of wine has been poisoned with Iocane Powder? (It’s odourless, tasteless, deadly, and apparently an Australian export.) *Spoiler alert* Our hero in Black prevails only because he has built up immunity to Iocane over several years. I don’t have to remind you sacred agents that there’s a lot of poison going round. On your journey of rescue you’ll face many battles-of-wits, where the binary options of fight and flight look equally unpalatable. Do you keep your head down and avoid the hostility? That doesn’t seem like Jesus. But nor does weighing in with hostility of your own. That’s where we need to be alert enough to see and select a third option Jesus offers us. This is the option of engaging with hostile people with radical love that turns the other cheek and goes the extra mile. It’s a lot easier for me to type this than practice it, because cheek-blows and pack-carrying are both quite painful. But it’s the only thing that will really progress our journey of rescue and redemption. It’s God’s chosen way to change the world. If following Jesus means getting up close and personal with a fair bit of poison, then we need to build up our immunity to it. Our first battle-of-wits is unlikely to be face to face with IS terrorists or the panel of The Project (not to compare them). It’s in the small barbs we’ll face each day from those we live and work with that we can practice Jesus’ redemptive presence and gradually build up our immunity to evil. It’s as we take to God in prayer the insults and pressures we face that we’ll build the capacity to absorb more. Every day we can build our cross-carrying muscles, and thus stay in the adventure to rescue the princess and see True Love prevail.